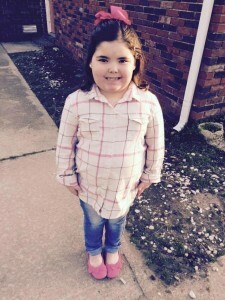 Reagann Duenne is 6 years old from East Prairie, MO. Reagann loves playing with her friends and cousins; she also loves school. Some of her favorite things to do are play with her babies, play Uno, work word search puzzles, and watch tv. Reagann is also a huge help in the kitchen and enjoys helping cooking. She dreams of being a chef one day when she is older as well as going to college like her older sister.